While Adelaide has long been regarded a key destination for medical conferences, the city’s reputation as a global medical hub has flourished with the arrival of BioMed City. The University of South Australia’s Cancer Research Institute recently joined the precinct, with SAHMRI 2, featuring the Southern Hemisphere’s first proton therapy unit, set to follow in 2022. Following three years of development, the University of South Australia’s $247M Cancer Research Institute officially opened in May, reinforcing Adelaide’s position as a leading light in cancer research. Located immediately adjacent to the Convention Centre’s West Building, the new Institute is home to the largest group of cancer researchers ever assembled in South Australia, offering a number of new cancer research, teaching and community engagement opportunities. Experimental Therapeutics, Mechanisms in Cell Biology and Diseases, Bone Growth and Repair, and Psychosocial Oncology research groups. In addition, the building houses the university’s technology-based business incubation hub along with MOD, a futuristic museum of discovery that is open to the public and features exhibitions focused on the “intersection between science, creativity, art and innovation”. Described as the ‘innovative future of healthcare’, the $300M SAHMRI 2 is set to join BioMed City in 2022. 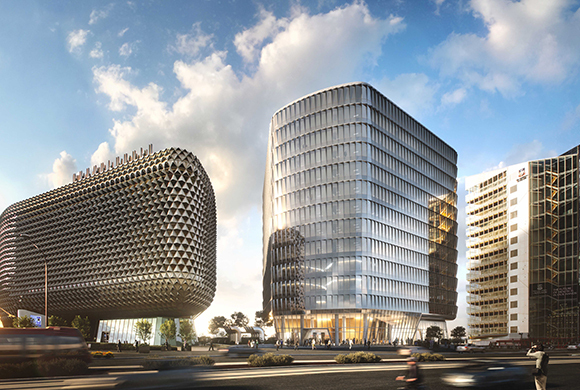 The new development, which will rise 14 storeys next to the existing SAHMRI building, is set to house more than 400 researchers. It will be home to the Australian Bragg Centre for Proton Therapy and Research—the Southern Hemisphere’s first proton therapy unit, capable of killing inoperable cancers. The Bragg Centre is expected to treat up to 800 people a year. In addition to supporting patients and their families, SAHMRI 2 is also expected to draw leading international researchers to the city, further strengthening Adelaide’s reputation as a cutting-edge medical destination. “This is a game-changer for patients and will put South Australia on the global stage for cancer treatment,” says Professor Steve Wesselingh, Executive Director, SAHMRI of the new development.